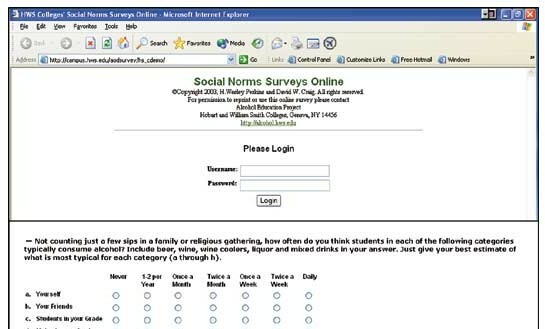 Web based surveys have been designed to support social norms programing in college and secondary school environments. Specifically, college student-athlete and greek surveys focusing on alcohol and tobacco use and other health related behaviors are available to support sub-population programming. A survey focusing on alcohol, tobacco, other drug use, and other health realted behaviors is available for programming in secondary schools as is a survey on bullying and school violence. Web surveys provide a secure, low cost, rapid data collection solution for social norms programming that provides for greater accuracy through real-time validation. Students can complete surveys in 15-20 minutes. Features of our web-based surveys with sample user interface screens are shown on this link (Click here). You can see some examples below of results from surveys that have been administered, run some sample surveys, and learn how you can use these surveys in your program. Recent research on thousands of middle and high school students from across the nation shows clear and pervasive misperceptions of alcohol, tobacco, other drug, health, and safety norms. Moreover, the pattern of emergence of these misperceptions by grade clearly point toward key developmental periods for strategic prevention intervention. 1999-2008 Survey results from over 52,000 secondary students from 78 middle and high schools in eleven regionally diverse states was recently completed and presented at the 2008 National Conference on the Social Norms Approach in San Francisco, California. The presentation abstract and results handouts can be downloaded here. 1999-2005 Survey responses about alcohol, tobacco, and other drugs from over 28,000 secondary students from 50 middle and high schools in eight regionally diverse states was recently completed and presented at the 2005 International Social Norms Conference in Toronto, Canada. The presentaton abstract and results handouts can be downloaded here. Survey results about alcohol, tobacco and other drugs from over 3,800 New Jersey students in 2006 attending 7 high schools across the state. "Where Does Bullying Take Place among Adolescents When They are at School?" presented by H. Wesley Perkins, Jessica Perkins, and David Craig at the American Public Health Association Annual Meeting, Philadelphia, PA, November 11, 2009. (abstract, handouts). "Misperceptions of Bullying Norms as a Risk Factor Associated with Violence among Middle School Students," presented by H. Wesley Perkins, David Craig and Jessica Perkins at the American Public Health Association Annual Meeting, Philadelphia, PA, November 10, 2009. (abstract, handouts). "Assessing Bullying In New Jersey Secondary Schools: Applying The Social Norms Model To Adolescent Violence" breakout session presented by David W. Craig and H. Wesley Perkins at the 2008 National Conference on the Social Norms Approach, Hyatt Regency San Francisco Airport, CA, July 21, 2008 (abstract, slides). "Social Norms Research on School Violence in England: Another Look at Misperceived Peer Norms as the Biggest Bully of All" breakout session presented by H. Wesley Perkins at the 2008 National Conference on the Social Norms Approach, Hyatt Regency San Francisco Airport, CA, July 21, 2008 (abstract, slides). Survey focusing on ATOD norms, healthy life styles, school safety, and traffic safety. Both English and Spanish versions of the survey can be accessed here (instructions for survey administration). Survey focusing on Bullying norms and perceptions. Both English and Spanish versions of the survey can be accessed here (instructions for survey administration). Click here for sample results. Survey focusing on alcohol and tobacco norms and perceptions, greek organization involvement, health and well-being, co-curricular activities, academic interests/accomplishments, post-graduation plans (instructions for survey administration). Survey focusing on alcohol and tobacco norms and perceptions, athletic involvement, health and well-being, co-curricular activities, academic interests/accomplishments, post-graduation plans (instructions for survey administration). Here are the steps that you need to take to use one of our web-based survey instruments in your program. Contact one of the project directors (H. Wesley Perkins, 315-781-3437 or David W. Craig, 315-781-3611) to discuss your specific application and the time you wish to conduct the survey. Discuss with a project director any customized questions you need for your programming beyond those questions already present in our survey instrument for your application. Setup a Schedule for survey administration for your population. Automatic coding by our web server means that results can be made available as soon as the surveys have been completed. Data bases generated by the online surveys are cleaned and validated to remove the few intentionally erroneous submissions by respondents that occassionally occur, thus providing reliable results (data cleaning procedure).